Listed below are Small & furry animals items for you to car boot sale online here that you will find available in United Kingdom. If you cannot find the Small & furry animals items that you are looking for in United Kingdom you can add your wanted item to let sellers contact you if they have any Small & furry animals items available for you. You can keep your contact information confidential. Enter only an email address in your car boot sale ad to receive offers into your account on our system. We will remind you automatically when new offers arrive for you. To offer your items for sale on this online car boot sale in United Kingdom simply click Post free ads for Small & furry animals link below or the button Post free ad in top right corner of this page. It is fast, easy and free to post an ad in 2lazy2boot. It will take you just few minutes to have the ad seen on our listings. You can then edit your ads any time by clicking “Member area" button on top right corner of this page. Large hamster cage for dwarf hamster so narrow bars. Has several levels, deep tray for burrowing, water bottle, feed dish, tubes. Everything needed for a happy hamster. Ours has unfortunately passed on. Cost £50 last year. Take £30 Can text photo if interested. Hereford area.. 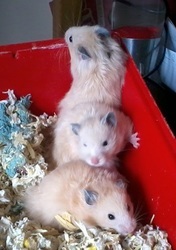 I am selling a variety of coloured hamsters all are between 6 weeks to 6 months old who needs loving homes. The mother has given birth to 12 so unfortunately I have to let some go. Also available are a number of cages at different sizes, can negotiate a price when coming around to view the hamsts ers. born 1/3/2014 very pretty and very friendly text or phone 07531 280666 £10.00 to collect weobley area. 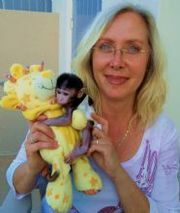 Excellent And Sweet Gorgeous baby Capuchin monkeys for Adoption. Lovely and jovial, pure breed monkeys. Gorgeous baby Capuchin monkeys for Adoption. All babies are raised in our home and Hand fed by my children and me. We spoil and give them the most Excellent attention. Our babies are ready to leave at 6 to 8 weeks Old. Adorable Baby Capuchin and Marmoset Monkeys for Adoption These lovely Capuchin, marmoset and squirrel monkeys are raised in our home with kids and cats, well socialized and very understanding and obedient. introduced to garden and surroundings. Fully vaccinated, de-wormed, micro-chipped and vet examined all up to date. Lucky is a very sweet chinchilla. Lucky is a very sweet chinchilla. He is always right at the door of the cage when you open it, raring to come out and play. He is very comfortable with people, and will hop right up onto your hands in the cage or onto your lap if you have him out for playtime. He is very. Lucky is a very sweet chinchilla. He is always right at the door of the cage when you open it, raring to come out and play. He is very comfortable with people, and will hop right up onto your hands in the cage or onto your lap if you have him out for playtime. He is very personable and loves interaction. Male grey chinchilla for sale. He comes complete withe 2 cages, food and all accessories. £100. Loving home required for our sweet little boy. He is apporx 5 years old, (chinchillas can live to about 20), fit, healthy and very friendly. House move forces sale. One cage is vertical and measures 35" high x 24" long x 18" wide and one horizontal which measures 36" long x 23" high 18" wide, the two cages connect by tunnels. FOP Pet Products Linea Natures comes with wheel, bowl, drinking bottle, tubes, wooden house, travel box. Well here you go. Good luck with your on line car boot sale in United Kingdom. We hope you have some success and find buyers/sellers that you are looking for in Small & furry animals . Don’ t forget to comment any successes in selling your Small & furry animals items in United Kingdom to our valuation window and report forum! We are sure you will find many people in United Kingdom looking for your Small & furry animals. United Kingdom car boot sale. Small & furry animals for sale ads on online car boot sale in United Kingdom, second hand Small & furry animals for sale in United Kingdom, Small & furry animals ads for free in United Kingdom, 2lazy2boot - United Kingdom car boot fairs.